Madhuri—daughter of Mr. Shalik Ram Maurya aged 23 years, is living in Kaima village, Varisganj block of Sultanpur district,Uttar Pradesh. Currently she is working as a dress designer in her own tailoring shop based at the Kaima Market. Her father Mr. Shalik Ram Maurya is a Farmer. The amount he earns is too little to maintain a family of 8 members. The family had no other source of income. Even in such a pathetic situation, Mr. Maurya was not able regularly to fulfill his duties. GVSS in collaboration with FVTRS organized a vocational training in Jagdishpur. Madhuri was one of the 60 trainees in the year there. She opted for and underwent an intensive training course in tailoring of a month’s duration. She made the best use of the opportunity given to her. She proved to be hard working, sincere and innovative in learning, and was intelligent enough to pick up many things within the short training period. Madhuri completed the course successfully. 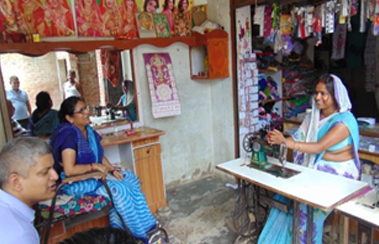 After completion of the course Madhuri started tailoring at home. Initially she earned Rs.100-150 per day. Now she earns Rs.4000-6000 per month after opening her own shop situated in Kaima Village. Besides, she earns more than 6000 in peak seasons. 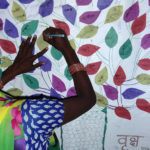 Admittedly, her income has added some value to the family This vocational training course facilitated by GVSS helped bring Madhuri out of her home in defiance of the traditional social barriers against women in orthodox communities. She has become empowered not only economically but socially as well. Poonam “An Entrepreneur” earning up to 20000.00/month. And she is also become an Employer- given job to 2 girls. Poonam belongs to a lower middle class family. Due to bad economical condition of her family she studied up to class 9th. But she always wanted to do something and stand on her feet. One day she came to know that the training on Cutting and tailoring for dropout youths was organized by Gram Vikas Sewa Sansthan, Jagdishpur, Amethi, She made contact with organization and started training. She attended the class regularly and completed the training successfully. She was a very fast learner and gave her full effort to learn cutting and sewing. After training she got a certificate. Later she married with Ramdev. She was living with her husband in a single room which was taken on rent. She started working with single machine from there. After continuous working many people came in her contact and gave their cloths to her for sewing. People always appreciate her work. Now she has a rented shop and started her boutique, from there she earns up to 20000/ month. She is happy with her family. Sunita Maurya belongs to a poor family. She had married in small age. She had no child for a long time after marriage, so her in laws were not behaving correctly. Due to the misbehavior, she had to suffer from metal disturbance. But her husband is supportive; he always said to her not to worry, everything will be good. 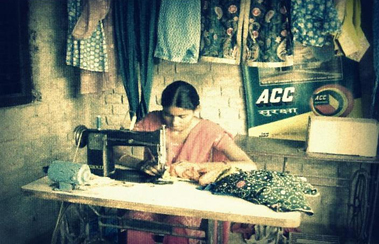 One day Sunita came to know that there is a training center of cutting and tailoring in Gram Vikas Sewa Sansthan. She enrolled herself and completed the tainting in 2007. She started working and earned up to 2000/ Month. Later Sunita got pregnant and had a child. After that Sunita started working with double energy and full of enthusiasm. In 2010-11 with the support from FVTRS, Bangalore GVSS organized vocational training program on Beautician for dropout youth. Sunita enrolled herself in training and completed the training successfully and started her Beauty parlor. She earned up to 10000-20000/ month from her beauty parlor. After seeing the demand of garments and cosmetic products she opened a shop of Ready Made Garment and Cosmetic Products near to her parlor. Now she is an Entrepreneur and earning up to 25000-350000/ month. And she is happy with her family and enjoying her life. Gokul is 49 years old, belongs to Muslim community. He lives with his family in a remote village called Korra, in Bhausia Block of Mangraura, District Pratapagarh, Uttar Pradesh. He has 4 Daughters and 2 sons. He is illiterates and his family depends on agriculture for their livelihood. His income is very low due to lack of income, is unable to maintain a family of 9 members. In March 2012 he got an opportunity to associate with the NGO- Gram VIkas Sewa Sansthan under the FASAL project. Organization did his training on modern techniques of agriculture it gave him an idea for sustainable agriculture. 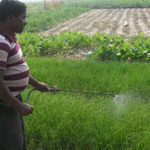 In this session he learned about the organic manure and pesticide preparation, vermin compost preparation, Machan technique, line sowing technique, mixed cropping, integrated cropping, SRI paddy cultivation and seed treatment, storage in organic process. He also visited to Narendra Dev Agricultural University under the FASAL Project and gained technical knowledge on farming. 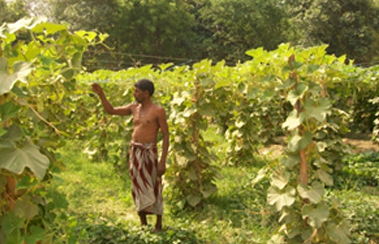 After learning, he adopts the new techniques of agriculture like Machan, Line sowing & Paddy SRI Cultivation etc. Using these techniques he sowed onion, Bottlegard, Zimkand, bitttergaurd through Machan technique and Paddy through SRI method and got the more crops. Now he is able to earn 4000 to 5000 P.M. and managed his family well.